Home > Fire Safety & EMS > Fire Safety Evacuation Supplies & Tools > Fire Extinguisher Cabinets & Covers > FireTech FT936 Surface Mount Metal Fire Extinguisher Cabinet - 20 lb. Home > Fire Safety & EMS > Fire Extinguisher Cabinets & Covers > FireTech FT936 Surface Mount Metal Fire Extinguisher Cabinet - 20 lb. Home > Fire Extinguisher Cabinets & Covers > FireTech FT936 Surface Mount Metal Fire Extinguisher Cabinet - 20 lb. FireTech™ FT936 Metal Fire Extinguisher Cabinets are constructed of 20 gauge galvanized steel with a rust-resistant white finish and a scored clear polystyrene break front. 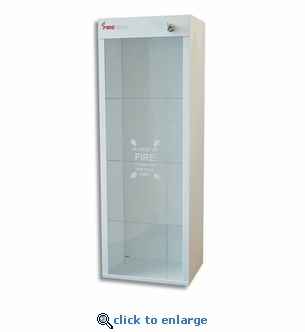 Use these quality surface mount extinguisher cabinets indoors or out to protect your 2 1/2 gal. or 20 lb. fire extinguishers and make them noticeable and easy to access. Breaker bar sold separately. Use with: 20 lb. or 2.5 gal. fire extinguishers.